What are the symptoms of foot problems caused by diabetes? How are foot problems caused by diabetes treated? Can diabetes-related foot problems be prevented? What is the prognosis for diabetes-related foot problems? A number of different kinds of foot problems can occur in people with diabetes. Two main conditions, peripheral artery disease (PAD) and peripheral neuropathy, are responsible for the increased risk of foot problems in people with diabetes. Symptoms and signs of diabetic foot problems arise due to the decreased sensation from nerve damage as well as the lack of oxygen delivery to the feet caused by vascular disease. People with diabetes have an increased risk of ulcers and damage to the feet. Diabetic foot problems also include bunions, corns, calluses, hammertoes, fungal infections, dryness of the skin, and ingrown toenails. These problems are not specific to diabetes, but may occur more commonly due to the nerve and vascular damage caused by diabetes. Treatment depends on the exact type of foot problem. Surgery or even amputation may be required for some cases. Gangrene (dry gangrene) is tissue death due to absence of blood circulation. It can be life threatening if bacterial infection develops (wet gangrene). Many diabetes-related foot problems can be prevented by good control of blood sugar levels combined with appropriate care of the feet. Both type 1 and type 2 diabetes cause damage to blood vessels and peripheral nerves that can result in problems in the legs and feet. Two main conditions, 1) peripheral artery disease (PAD), and 2) peripheral neuropathy are responsible for the increased risk of foot problems in people with diabetes. Peripheral artery disease (PAD), sometimes referred to as peripheral vascular disease (PVD), means that there is narrowing or occlusion by atherosclerotic plaques of arteries outside of the heart and brain. This is sometimes referred to as "hardening" of the arteries. Diabetes is a known risk factor for developing peripheral artery disease. 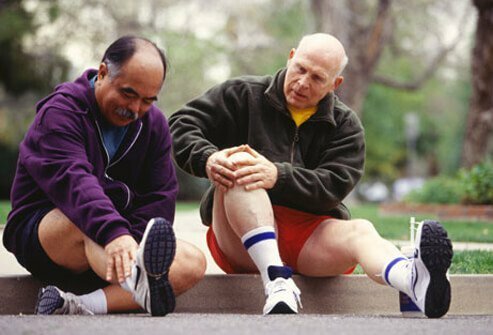 In addition to pain in the calves during exercise (medically known as intermittent claudication), the signs and symptoms of peripheral artery disease relate to a decreased delivery of oxygen to the lower legs and feet. In severe cases, the lack of oxygen delivery to tissues can result in ulcers and even gangrene (tissue death). Peripheral neuropathy refers to damage to the peripheral nerves directly as a result of diabetes. Symptoms of peripheral neuropathy include decreased sensation in the nerves of the legs and feet, making it difficult to perceive injuries due to lack of feeling. Peripheral neuropathy also causes a tingling, pain, or burning in the involved areas. It can also cause the muscles of the feet to work improperly, leading to misalignment of the foot that can put pressure on certain areas of the foot. In the most severe case, as mentioned above, due to a combination of decreased sensation and reduced blood flow to the feet, ulcers may develop. If the tissues continue to receive insufficient oxygen, tissue death (gangrene) occurs. Gangrene is a serious and potentially life-threatening condition. Other potentially serious problems that may develop include cellulitis (infection of the tissues beneath the skin) and osteomyelitis (infection of the bone); sepsis (the infection spreads to the bloodstream) also is possible. People with diabetes are at increased risk for milder problems with the feet that are not specific to diabetes but may occur more frequently due to problems with the nerves and circulation to the feet. Hammertoes, or bent toes due to muscle weakness. Bunions, or the angling of the big toe toward the second toe. The area of the bunion may become reddened and irritated, leading to callus formation. Taking proper care of your feet (see Prevention section) can help prevent or relieve many common foot problems in people with diabetes. Apply lotion to dry areas, especially heels, but don't use lotion between the toes. Corns and calluses can be lightly smoothed with a pumice stone. Never use scissors or razors to cut away corns or calluses. The outlook depends upon the severity of the foot problem. As mentioned before, gangrene can be life-threatening if bacterial infection develops in the dead tissue area. Severe gangrene may result in the necessity for amputation of the affected area. Other foot problems are less severe but may nevertheless lead to reduced function or discomfort. Patients need to understand that for the best outcome of foot problems caused by diabetes is life-long monitoring of their feet for problems and consulting their doctor immediately if a problem begins to develop. Khardori, RK, MD. "Type 2 Diabetes." Medscape. Updated: Nov, 07, 2017. Bronze, MS, MD. "Dibetic Foot Infections." Medscape. Updated: Apr, 05, 2017. What kind of problems have you had with your feet due to your diabetes? What measures do you take to prevent problems with your feet due to diabetes? What symptoms and problems have you experienced with your feet due to diabetes? Please share your experience with foot issues you have had as a complication of your diabetes. What foot problems have you experienced as a person living with diabetes, and what symptoms were associated with the foot issues? What treatments have been effective in treating the foot problems you have experienced as a person with diabetes? What foot problems have you had as a complication of diabetes? See pictures of celebrities that have been diagnosed with type 1 or type 2 diabetes including Mary Tyler Moore, Salma Hayek, and Nick Jonas from The Jonas Brothers. Corns generally occur on the tops and sides of the toes. See a picture of Corns and Calluses and learn more about the health topic. Did you know that certain shoes and common diseases can wreak havoc on your feet? If you've been having problems with your feet, this quiz is for you.